The shoreline of Anne Arundel County, Maryland stretches from the Baltimore City line along the mouth of the Patapsco River, then down Chesapeake Bay to the Calvert County line. The waterfront, including rivers, creeks and bays, is more than 400 miles long. This includes the City of Annapolis and its harbor as well. These inlets and bays are lined with over 300 marinas and 12,000 private boat slips as well as a few large commercial operations. From spring to fall, these waters are teeming with recreational boaters. Year-round activity includes watermen in small boats plying their trade up to 900-foot long container ships going in and out of Baltimore. Waterside protection is provided by fire and rescue boats that are owned by several volunteer fire departments as well as one fireboat that is owned and operated by the career department in Annapolis as well as Anne Arundel County's boat. 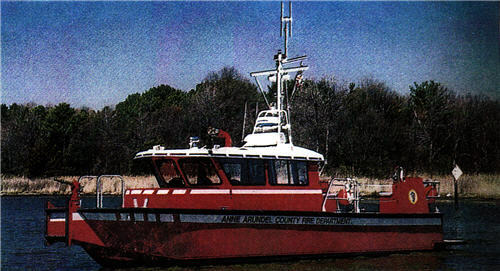 Since 1999, Anne Arundel County has operated a fireboat from a marina in a basin known as Mezik Pond at Sandy Point State Park, located at the point where the Patapsco River meets Chesapeake Bay. A short channel from Mezik Pond leads into Chesapeake Bay along the northwest approach to the Chesapeake Bay Bridge. Now, the Anne Arundel County Fire Department has a new 43-foot aluminum fireboat known as Fireboat 61. It has a beam of 14 feet 6 inches and with its mast in the raised position, is 24 feet above the water. The mast can be lowered, allowing the boat to get under bridges with a clearance of about 14 feet. The hull of the boat is reinforced to allow operations in ice, but is not designed to break ice. The boat was built by MetalCraft Marine in Kingston, Ontario. It is powered by twin 580 hp Cummins QSM-11 diesels powering Hamilton Model 322 water jets that drive the boat at speeds of up to 37 knots (about 42 mph). Using water jets rather than conventional propellers allows the boat to operate in waters as shallow as 2-1/2 feet deep. It also limits the risk of getting foreign materials tangled in the propellers. It is also safer for divers operating from the boat. The boat is also equipped with a 6.5 kW Onan generator. Unlike most water jet driven boats, this one has reverse gears. Normally, the thrust from water jets is diverted to shoot forward to back the boat up. This boat has that system but the direction of the impellers can be reversed to blow out any foreign matter that the jets might have drawn in. Two Darley LS model 1000 gpm pumps are driven by the propulsion engines through power-take-off. Since these pumps are located just above the waterline, there is no lift involved and the pumps actually deliver 2850 gpm. When pumping, the engine rpm is set for the desired pressure and the water jets can still be used to propel or maneuver the boat. The boat is fitted with two monitors, a 2000 gpm, remote-controlled one atop the cabin and a manually controlled 1000 gpm capacity monitor mounted at the bow. There are two discharges, one on each side that are rated at 1000 gpm and a 5-inch Storz connection aft. The boat carries monitors that can be fitted to these discharges. Foam eductors with 10-foot long pickup tubes can be dropped into one or both of the boat's two 35-gallon foam tanks that are located in the engine room or can draw from drums of foam that might be brought alongside during an extended operation. Under normal conditions, preconnected hand lines are hooked to these discharges. The cabin of the boat is heated, air-conditioned and equipped with all the necessary marine electronics. There is a marine toilet, microwave and small refrigerator for crew support. A bench in the cabin is designed to carry a stokes litter or a back-boarded patient. Under the bench is stowage space for EMS equipment and there are power outlets for charging various EMS gear. The boat is crewed by the personnel of Station 19. All Anne Arundel firefighters are EMTs and many are paramedics. If the boat is dispatched on a call where advanced life support may be necessary, a medic unit crew will respond on the boat. Most of the gear needed for ALS is already aboard the boat. There is a large diving platform at the stern and a broad stairway extends across the transom that allows personnel easy access to and from the diving platform to the main deck. There are grab handles and safety rails all around the cabin as well as a provision for personnel tethers. This new boat, named Lady Anne, cost $460,000 and adds a whole new layer of fire and EMS protection to Chesapeake Bay.